Our biking trip in Laos got off to a rather inauspicious start when our guide got into an accident no less than five minutes into the first ride on the first day. Not only did he hit a truck (or perhaps the truck hit him; as with most things in Laos, it is not quite clear), he severed the side mirror completely off the vehicle. Luckily, he fared much better than the truck and emerged largely unscathed, carrying the shorn off mirror in his hands. It turned out that the accident was a fitting way to start our trip. Traveling the roads in Laos is akin to participating in a fire drill at an insane asylum. Describing it as organized chaos would be a compliment. Part of the problem is that there are simply too many variables. To begin with, there are the non-human factors: chickens, dogs and the occasional water buffalo. The dogs were everywhere, but for the most part they stayed stationary, languid in the heat and humidity. Usually dogs chase me for sport, but these dogs simply couldn’t be bothered. The chickens, on the other hand, loved jumping out of the brush to scare the living daylights out of me. Luckily, they managed to get out of the way quickly and other than one near-miss with a little chick that left me screaming, the chickens and I came to an agreement of non-engagement. The roads in Laos are in a remarkably consistent state of decay. They are somewhat rough but lacking the cyclist’s worst enemy: pot-holes. 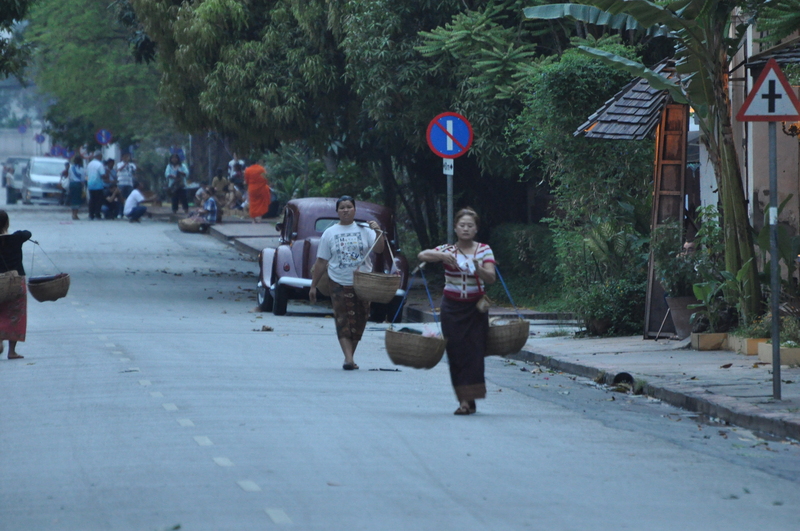 From a pavement perspective, the roads of Luang Prabang are a smooth-as-a-baby’s-bottom delight compared to Sheridan Road heading out of Chicago. Therefore, other than the occasional chicken attack, it was easy to maintain a good, predictable wheel. There are, however, few sidewalks, which means pedestrians are also part of the traffic flow on the road. Keep in mind that this includes women with basket-draped bamboo rods on their shoulders. Woman in center, 5-6 feet of bamboo spanning her shoulders, and then two large woven baskets, one dangling from each end. It makes for a wide obstacle taking up precious road space. So to put it all together, you have vehicles roughly in their lanes, motorbikes and bicycles weaving around the cars and trucks on both sides, pedestrians (basket-draped or not) on the periphery, and various animals added in just for fun. It’s a lot for the senses to absorb. Most of all, it is the motorbikes that keep you on your toes, and brakes. They dart like the chickens, but are far more ungainly, particularly since they sometimes carry entire families: dad in front, mom holding the baby in the middle, and grandma sitting side-saddle hanging on for dear life in back. It seemed that motorbike accidents were ubiquitous. Most appeared to be minor, thanks to the relatively slow pace of traffic. Some however were more serious. On our afternoon ride on the first day, we came across a motorbike wedged entirely under a truck. It was hard to visualize how the accident happened; it looked like a crane had picked up the truck and simply lowered it directly onto the motorbike. A small pair of yellow sandals lay nearby, the only clue signifying the seriousness of what happened. 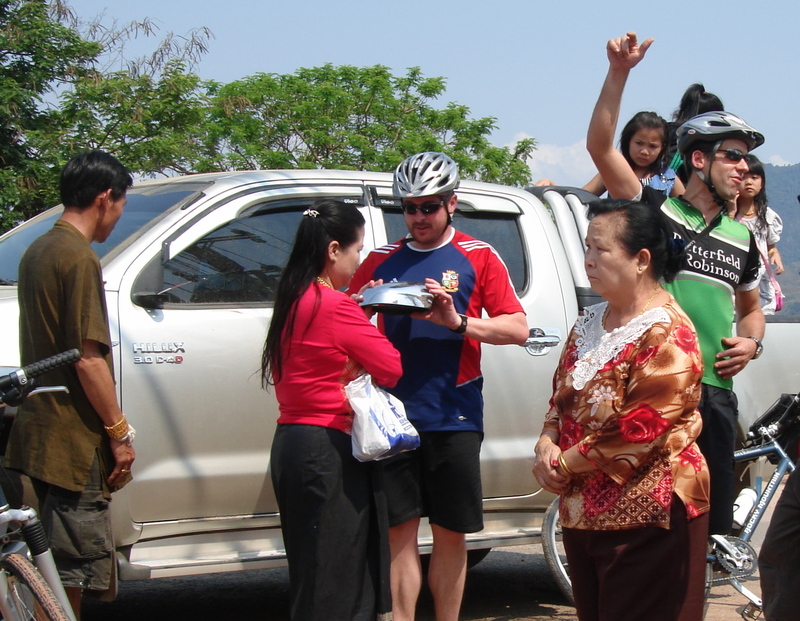 Our tour of Lao traffic accidents continued on the second day of our trip. There were four of us headed out of town off the front of the main group. As we came up to a turn in the road, about a quarter of a mile ahead, I saw a motorbike coming the other direction. The motorbike lost control on the turn and went straight off the road, disappearing into the thick vegetation. As we approached the turn, I kept expecting to see the driver dusting himself off on the side of the road, yet no one was visible. Then I heard the sound of a baby crying. We quickly pulled over and jumped off our bikes. A Lao gentleman coming the other way in a truck had also stopped; instinctively, he and I rushed down the embankment towards the sound of the baby. I had a brief moment of second guessing myself: what the hell was I doing? What if there was some horribly gruesome scene waiting for me? I am one of the most squeamish people I know, I can’t stand the sight of blood, and just the thought of twisted bodies makes me faint. But, a baby was screaming so there really seemed to be no choice. The mom (who, by the way, was just a girl herself) was lying on her side next to the motorbike. The baby had crawled over to her and was propping itself up on her hip, wailing. The Lao gentleman who was with me jumped down the hill to grab the baby, and that is when we realized that what he had jumped over was a man, presumably the driver, completely unconscious in the brush. I knew pretty quckly what I should do, and turning over the unconscious man to assess his injuries was clearly not it. I did what any mom would do: I grabbed the baby. She was light as a feather, but apparently unharmed. By then a few other people had joined us, so I took the baby back up to the road and let the others tend to the more serious injuries. When they lifted the driver and flipped him over, I was scared to death of what I might see: a CSI-worthy gore-fest? Fortunately, both the driver and the woman seemed quite bloodied but largely intact. It took a while for the man and woman to regain consciousness, especially the driver, but eventually they both came around. In the meantime, I was assessing the baby, an adorable little peanut of a girl. She had a bit of a bloody lip, and it looked like she had possibly lost a tooth, but she was otherwise intact. Eventually, the mother got to her feet and made her way up the hill. I handed back her little girl. The crowd started to work on getting the motorbike out of the brush, and we decided to head on our way, slightly shaken. As I looked back, the motorbike was being pulled up, the driver was standing upright, and it seemed as if this little family would continue on their journey, no worse for the wear. Of course, I am sure the guy got quite a lecture from his wife that night about driving too aggressively. Some things transcend culture. Keep your eyes on the road and have fun!!!! Wow, what a day in the life! So happy you were there to hold that little bambino! Enjoy all the little moments for all of us and try to come back in one piece! Unbelievable! A screenplay in the making….keep writing! And watch where you’re going.